‘In November and with the permission of the local land owner, the Miner’s track on Snowdon was used for a one-off Hyundai event. Hyundai does sincerely apologise if the project has in any way been misleading in its use of the Miner’s track. Please be assured that the intention of the activity was absolutely not to disrespect the wonderful landscapes that were visited or to encourage people to drive this track (as it is not open to the public), but it was to celebrate them and inspire people to learn more about the amazing country that we live in. However, due to the unintentional upset that this has caused, Hyundai will be making a goodwill donation for the future conservation of the area. We have contacted the BMC to provide funds specifically for Cader Idris (as suggested by the National Park Authority) and will ensure no further communication encourages any driving of the Miner’s track. The point about respect for the mountains has been clearly made. In turn we respect the way Hyundai has been prepared to respond reasonably and we would now like to draw a line under the matter. There is no need for further correspondence with Hyundai. 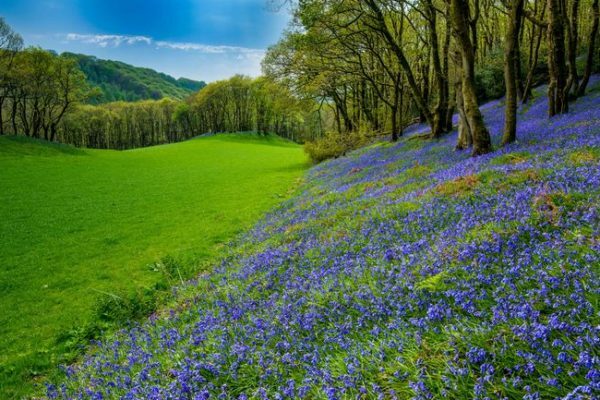 Hyundai UK’s publicity stunt sets an irresponsible example and undermines respect for our mountains and National Park. Hyundai’s brand slogan is ‘New Thinking, New Possibilities’. 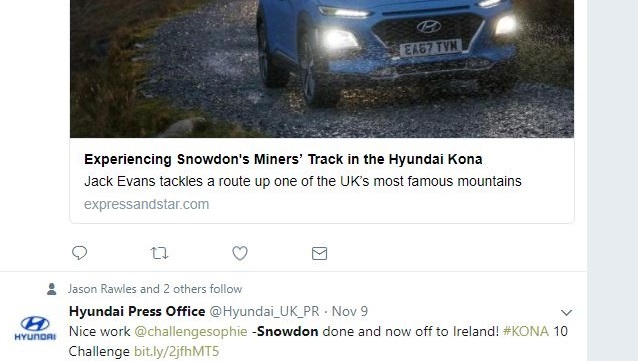 So it is disappointing that Hyundai didn’t think before going ahead with a promotion which involved driving a Hyundai Kona up Snowdon’s Miners’ Path. 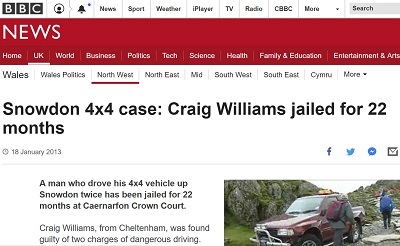 Driving on Snowdon wasn’t a particularly creative idea- after all it’s been done before, resulting in a prison sentence in one recent case. What Hyundai did was a stupid stunt. The problem with it is the example it sets and the way it undermines respect for special places and the work of looking after them. Needlessly driving up the Miners’ Path shows no respect for the work that goes into maintaining the vital footpaths up Snowdon. 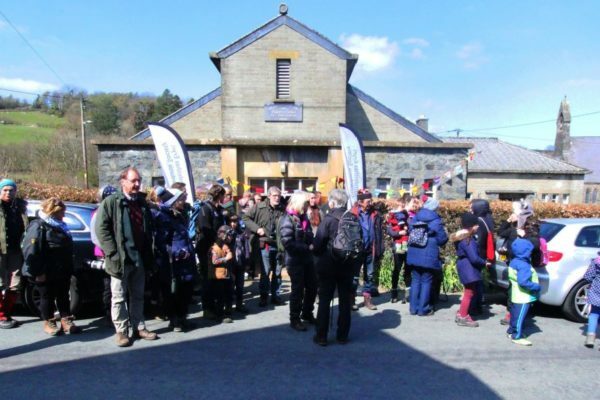 Charities like BMC raise funds to Mend Our Mountains, National Trust employ a footpath team, and Snowdonia Society volunteers go out in all weathers to maintain paths on Snowdon and elsewhere. Hyundai may have had the landowner’s permission and be ‘within their rights’, but glorifying driving on Snowdon is deeply irresponsible. When the next idiot is inspired by stunts like this to drive on Snowdon, damaging paths and endangering lives, who will pick up the pieces? Will it be Hyundai? No it won’t. It will, as always, be the National Park Authority (and it’s partners) who have to clear up the mess and foot the bill. 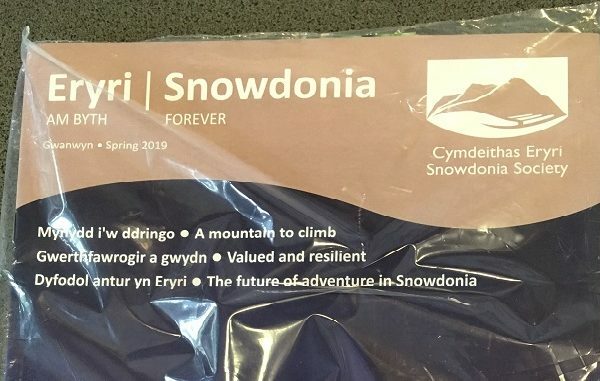 Despite savage budget cuts they will carry on with the work of managing Snowdonia for the benefit of all the decent people who want to enjoy the mountains in a responsible way. So come on Hyundai: put the grey cells in gear. Set a more responsible example, show more respect for our mountain landscapes, and align your publicity stunts with rather than against the work of organisations caring for this special place. Snowdon is not the place for this. Thank you to all who wrote – politely and reasonably – to Hyundai about this issue. The matter has been satisfactorily resolved – there is no need for further correspondence.